The TTC’s Operating Budget and a proposed fare increase will be considered by its Board on January 24, and subsequently by Council through its budget process. Management recommends a ten cent increase in the adult and senior/student fares with proportionate increases in multiple fare media (passes or their equivalent on Presto). 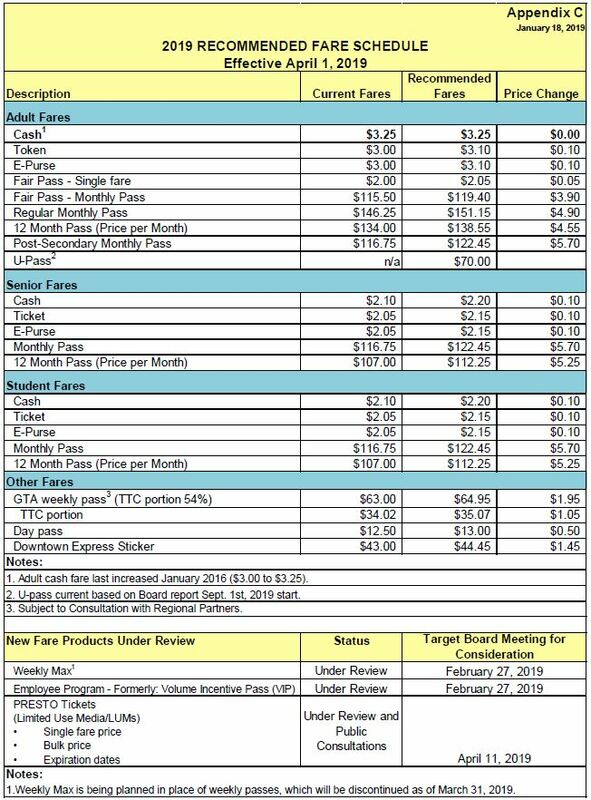 The new fares are projected to generate $25.6 million in revenue the TTC otherwise would not get for the nine months from April 1 (when they would go into effect) through year-end. The TTC is also seeking $22.0 million in additional City subsidy to cover costs, many of which were already mandated by Council, that only existed for part 2018. Working through the Operating Budget is always a challenge not least because the numbers are presented on a budget-to-budget basis with little reference to actual results. What typically happens each year is that if a shortfall by year-end is foreseen, expenses will be cut back to fit the available funding. Conversely, results can be better than expected and the TTC winds up with a “surplus” which is really a lower subsidy draw than budgeted. Unexpected costs and savings can occur for a variety of factors including changes in pricing versus initial estimates (common for energy costs), legislative changes affecting employee working conditions and benefits, ridership above or below forecast, and a mix of fare revenue that yields a different average fare per ride. Collectively, these amounts can range above $100 million and many of them are not under the TTC’s direct control. Council, however, is terrified by even a $10 million extra call on subsidies because this represents roughly a 1/3% property tax increase. Ideally (for the politicians), the TTC should come in under budget and thereby “save” money versus original subsidy projections. I will explore the TTC’s costs and revenues in the second half of this article, but for now the question on everyone’s mind: fares. To save everyone asking, yes, I support the fare increase, but with some caveats discussed later in this article. For many years there has been a call for the TTC to return to a 2/3 farebox, 1/3 subsidy ratio as a “fair” balance between riders and government support. In the 2019 proposed budget, fares will cover 62.6% of total expenses, and a further 3.7% will come from miscellaneous revenue such as advertising. There is a basic problem with picking any target as the “ideal” farebox:subsidy ratio. If policies such as fare freezes drive the ratio down, there will be “relief” for riders in the short term, but eventually one will reach the new plateau and be faced with annual increases. One cannot simply keep moving the goalposts especially when better service and system capacity are important to the transit system’s credibility. The table below is taken from the TTC’s 2019 Operating Budget report. The single fares for both adults and seniors/students will rise by ten cents, and so there is a higher percentage increase on the concession fares than those for adults. The various classes of passes go up by roughly ten cents times the existing “fare multiple” versus single fares. For example, a regular monthly pass is $146.25, or 48.75 times the $3 single fare. The pass goes up by $4.90, or 49 time ten cents. Other passes shift by their respective fare multiples. Phase 3 – starting in March 2020 – extend eligibility to all other Toronto residents living with an income below the Low Income Measure +15% threshold. $48.0 million at full rollout in 2021. There is no indication of whether the second and third phases will be funded by the City although statements by the Mayor imply that programs already in the works would be funded for 2019. The bigger jump will come next year. The TTC and the City face difficult choices about expenses and revenues, but this should not stop them from looking beyond current approvals. The Fair Pass should be funded as proposed for Phase 2 in 2019, and direction should be given that funding for Phase 3 be included in the 2020 and following budgets. That is a challenge for Council because the jumps in 2020 and 2021 represent roughly a 1% property tax increase between them. The concept of a Fair Pass discount should be reviewed for poor seniors for whom the Fair Pass is only a minuscule discount compared with regular seniors’ fares. Presto cards should be available from the TTC at a nominal cost, say $1 or $2, not the $6 now charged. Riders should not be dependent for cheaper or free cards on TTC giveaway programs when they occur. With the move of cash fares to a collection mechanism that will issue a fare receipt, the two-hour fare should be extended to those who pay cash. This is the only group who will not have this privilege under the current plans (see below). For the purpose of the two-hour transfer, any single fare should be eligible. The shift to electronic media will continue this year as various existing formats are phased out. I clarified some issues with Heather Brown at the TTC, and her replies are quoted below. Although the Day Pass is shown in the table above, the TTC intends to drop it at a date to be announced later in 2019. Their position is that the two-hour fare introduced in late 2018 provides a discount for chained trips (hop off, hop on riding), and the Day Pass is now superfluous. This also means that the weekend and holiday “family pass” function of the Day Pass will disappear. However, there are still plans for a Day Pass ticket (see below). Although this is not before the Board in January, management plans to recommend that the Weekly Pass be replaced by a trip cap within Presto. The number 16 has been suggested, but this is still to be confirmed when the Board discusses the matter in February. Tokens and tickets will be replaced by Limited Use Media or “LUMs”, cardboard versions of Presto cards that will be valid in “one-ride, two-ride and day-pass ticket formats”. LUMs will be available for purchase from Presto machines starting in June. Fares paid using them will get the same two-hour transfer privileges of regular Presto cards. Current plans are to stop sale of tickets and tokens in late summer 2019, and stop accepting them for fare payment in 2020. LUMs will only be available for Adult fares. Those who wish to receive concession fares will have to switch to using a Presto card. Cash fares will continue to be accepted on buses and on the older streetcars pending their retirement, and in subway stations where there is a farebox available. Someone who pays cash into a farebox will need a receipt that is capable of being read by fare gates for connections at locations that do not have a closed transfer connection (e.g. Dufferin Station) and this would also apply to cases where buses are substituted on routes normally served by new streetcars with fare vending machines. Fares paid by cash will not be eligible for the two-hour transfer privilege. The arrangements for cash fares still do not address how someone with a paper fare receipt such as that issued on a streetcar will access a subway station, especially if the transfer rules enforce only “official” transfer locations and a car is on diversion, a common situation downtown. The question of regional fare integration has fallen into a black hole ever since the ascension of the Ford government at Queen’s Park and the repudiation of the previous government’s spending promises. These included a $1.50 discount for cross-border trips for adult single fare payers using Presto, as well as lower fares for short distance trips on GO Transit. What, if any, part of this will be implemented will probably have to wait at least for the provincial budget in March 2019. That discount, of course, was flawed in that it was not available to those who travelled using a pass, only single fare riders, and the GO+TTC cofare already in place offers a much smaller discount for seniors and students than for adults. There has been no public discussion of integrating fares so that, for example, a “two hour fare” ignores the boundaries between all local transit systems. All of this is further complicated by Queen’s Park’s planned “subway upload” and the as-yet unknown financial arrangements for operations and maintenance of the system. This entry was posted in Fares & Fare Collection, Finance. Bookmark the permalink. I wonder how elasticity of demand will factor into all this. Economically speaking, there is only a finite amount people are willing to pay for what they perceive an item to be worth. After a certain point, monthly passes will become too expensive and demand for them will crash. Essentially, the demand will no longer be elastic and the band will break. Honestly, I wonder if the TTC is putting all their eggs into one basket and ignoring the fact they may have a problem on their hands. Steve: Past experience has shown that modest fare increases are accepted by riders provided they perceive the service as worth “buying”. If anything, there will be a migration away from monthly passes with the availability of the two-hour transfer and the coming automatic weekly caps. It is good that the fare increase comes with additional fare inspectors and transit enforcement officers because fare increases directly cause fare evasion. I personally stopped paying fare when the fare was increased dramatically by 25 cents in 2010. Now, I use my daughter’s presto card to use the subway for free (I almost never need to use buses or streetcars). At some point in the future, the TTC should look into eliminating all cash fares entirely and making PRESTO an absolute-must for every single customers, I will not allow cash fares to be taken on any TTC surface vehicle and I will force every single rider to require a PRESTO card in order to board any TTC bus or streetcar or to enter any subway station in the future. Go to places like Europe, London England, Melbourne Australia, Amsterdam or one of the most developing countries on the planet earth, they do not allow people paying by cash, you have to have a card before entering the system, or else no ride or be kicked off and face a big fine, this is what the TTC and other GTHA transit authorities should do in the future. Eliminate the cash fare and replace it with a PRESTO card so it will be the only way to enter the system. Eliminating cash fares makes things much more safer for drivers, safer for passengers, faster, more reliable and more on time. Also eliminates fare disputes and driver assaults, and will allow vehicle drivers to solely focus on driving the vehicle and the task of the roads. I have called on city councilors, MPPs, MPs the prime minister Justin Trudeau, premier Doug Ford and mayor, John Tory to call on the TTC to eliminate all cash fares entirely. What do you think Steve? TTC drivers should no longer handle/enforce fares anymore across all modes system-wide (bus, streetcar and subway) anymore. They will have to purchase their fares prior to boarding any vehicle or entering any subway station for people travelling without a PRESTO card. Believe me, eventually (at some point in the future) there will be no more cash fares and PRESTO will be the only to get around the TTC. Steve: The TTC reported only a few days ago that 78% of all fares are now paid by Presto. Tokens and tickets will disappear later this year, and the only place left you will be able to pay cash directly to the operator will be in a bus farebox. The new streetcars have only fare machines, and subway stations are slowly losing their fare collectors. The main reason there will be a residual use of cash on buses, I suspect, is that the network of places where one can buy and load Presto cards is much more spares in the suburbs where buses carry the lion’s share of riders, and many of their trips don’t go to a subway station. I think your polemic on this issue is several years out of date. There are lots of things I might to were I Transit Tsar, but I would not write an article saying “I will not allow …”. I have to report on this and a quick chat would help me a lot. Steve: Sorry, but I have not been in my site checking for comments until now (4:45 pm).